A comprehensive range of spares and repair services are available for both analogue and digital AMEK equipment. AML holds significant stocks of most of the commonly needed repair parts for AMEK equipment and is able to provide a full fitting service at competetive rates. A full catalogue of components is available and these may be shipped at low cost to most destinations around the globe. Additionally, AML has a comprehensive range of second hand equipment available including full modules and components. AML can provide a whole host of spares and repair services for TAC mixing consoles, both new and second hand equipment is available to ensure the longevity of these highly cherished consoles. AML holds stocks of all the Omeg range of pots, Alps faders and switches used on the TAC consoles and is able to provide a full fitting service at competitive rates. A full catalogue of components is available and these may be shipped at low cost to most destinations around the globe. AML has a comprehensive range of second hand equipment available including full modules and components. As part of AML’s commitment to these products, new designs are being developed to replace previously obsolete devices such as the LED bargraphs and microphone input amplifiers. As the UK’s ONLY authorised after sales and service provider for Penny and Giles Controls Ltd, AML is able to provide individual spares components for faders and joysticks, fader refurbishment services and is a major stockholder of many commonly used manual and motorised audio faders. AML is the only company in the UK who is able to provide such a comprehensive level of coverage to the Professional Audio user. If you are looking for spares or consumables, or are considering a fader replacement or upgrade, AML can offer both supply and advice on all aspects of Penny and Giles products. 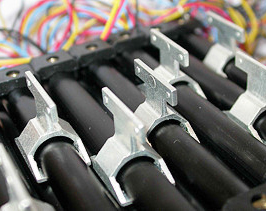 Penny & Giles manufacture a large range of similar controls with totally different internals. To order complete faders or individual parts, it is essential to locate the unique D number found on the fader label and specify this code when you call or email. This guarantees you'll get the correct version for your product. For more fader details visit the Penny & Giles web site. © 2019 Audio Maintenance Limited - All logos, trademarks and copyrights are the property of their respective owners.